Electric vehicles are fertile ground for innovation because the availability of suitable motors, controllers, and power sources makes experimentation accessible even to hobbyists. Even so, [John Dingley] has been working on such vehicles since about 2009, and his latest self-balancing electric unicycle really raises the bar by multiple notches. 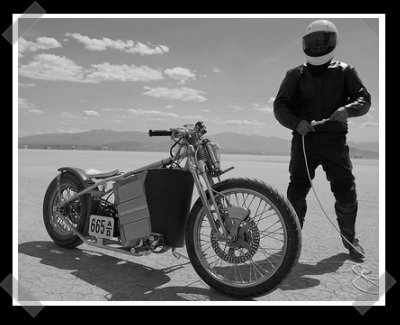 It sports a monstrous 3000 Watt brushless hub motor intended for an electric motorcycle, and [John] was able to add numerous touches such as voice feedback and 1950’s styling using surplus aircraft and motorcycle parts. To steer, the frame changes shape slightly with help of the handlebars to allow the driver’s center of gravity to shift towards one or the other outer rims of the wheel. In a test drive at a deserted beach, [John] tells us that the bike never went above 20% power; the device’s limitations are entirely by personal courage. Watch the video of the test, embedded below. A student team at Ohio State University has designed and built a custom Controller Area Network (CAN) data acquisition system complete with a sensor interface, rider display, and a Linux-based data logger for a RW-2x motorcyle. They call their small, convenient micro-controller circuit board the Magic CAN Node, and it measures automotive sensors throughout the electric vehicle. This includes a variety of thermistor resistors to check changes in temperature. A few 0-5V and 0-12V sensors to monitor brake pressure transducers along with some differential air pressure sensors can be added too. Since the vehicle is basically a “rolling electromagnetic noise bomb”, they wanted to keep all of these analog sensors as close to the source as possible. The Magic CAN Node is based on a Texas Instruments microcontroller called the TMS320F28035. This keeps the energy consumption at a low level. For message handling, the team, led by [Aaron], tapped into the built-in CAN module within the F28035. All of the CAN plugs have two of the pins shorted to GND or +12V, so when there’s only one plug connected, the analog switch IC will connect a 120 ohm resistor across the CAN lines. 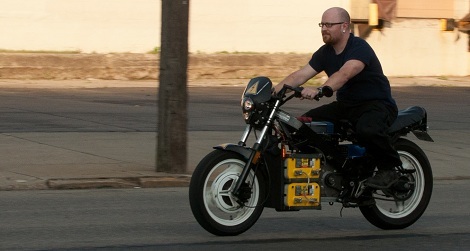 The folks over at the Cincinnati hackerspace Hive13 were wowed last week by an electric motorcycle built by one of their own. [Rick]’s new ride is built from a 1989 Honda VTR 250. After removing the 24 HP motor, the frame was loaded up with four deep cycle batteries and a DC golf cart motor. Even with the addition of the four heavy batteries, the new electric bike only weighs about 70 pounds more than the stock Honda, allowing all that power to be translated into speed. Right now, [Rick]’s build can reach 54 mph; comparable to an earlier ebike we saw, but [Rick] can also go 100 about 20 miles on a single charge. After the break you can see a short time lapse of [Rick] tearing down his bike, the first ride though the Cincinnati hackerspace, and a very nice road test showing off the speed of [Rick]’s new ride. There’s also a great Flickr slideshow with some really great pics of the build in progress. Very nice work, [Rick]. On the list of things we’ll build ‘when we get a few free weekends,’ an electric motorcycle is right at the top. With a 20-mile range, they may not be as versatile as a car or truck, but we can’t imagine a vehicle better suited for making a quick jaunt around town. [Ben Nelson] just finished his electric motorcycle and put up a great Instructable on converting an ’81 Kawasaki KZ440 to battery power. After going over the rarely mentioned aspects of license, registration, and insurance, [Ben] started his build by pulling the engine from his bike and installing an electric motor. The batteries used weren’t insanely expensive LiPo cells, but instead cheap lead-acid units. The calculated range with the lead-acid batteries was 26 miles – perfect for a trip to the next town over and back. After everything was cabled up, chain wrapped around sockets, and an awesome yellow paint job applied, [Ben] finally took his bike for a test drive. Check out the videos after the break for an idea of how fast [Ben]’s bike can go. Every so often I have to slap myself in the head. I’m surprised that we haven’t covered these things by now. 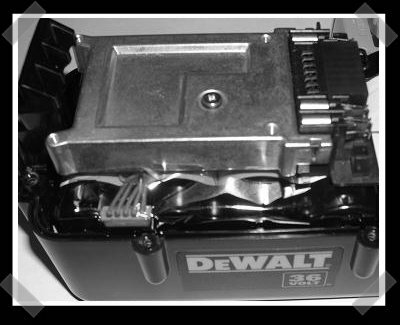 DeWalt’s been selling a LiIon 36 volt battery pack that’s full of the latest A123 cells. These are the same ones that were used in the Killacycle. (I think they’ve got a new batch of cells now). [Robert] sent in a scooter that’s been designed to run these same cells. The custom fabrication and machine work looks fantastic. [Zach Norman] built this electric bike on a Harley frame. I couldn’t dig up much in the way of details, but the flickr photo set looks good. [Micheal Raines] built a great looking electric chopper. Early this morning [tnkgrl] sent in her HSDPA mod for the OQO Model 2. Engadget beat me to it, but it’s a great mod for anyone who visits outside of those handy EVDO areas but want the speed for their UMPC. Living in the middle of nowhere means that I’m stuck with RxTT. [andrew] built a handy parallel port A/D converter – so far he’s got it logging temps. The parts count is pretty low, depending on an ADC, a 555 and some OP amps.